Back in January I posted a recipe for a family favorite, Taco Pie. 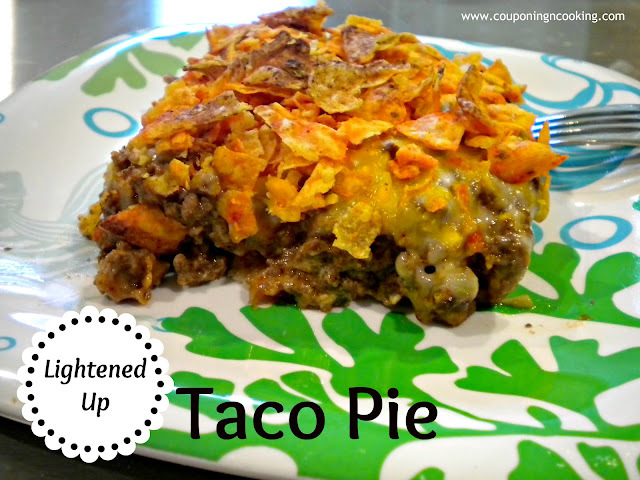 While Taco Pie is delicious it is clearly not so good for you. The original recipe calls for sour cream, lots of cheese, and Doritos. Whoops. A few friends and readers asked if there was a way to make it lighter and I decided to experiment and find out of you could cut some of the fat while still keeping it something you would enjoy eating. While this new recipe isn't "good for you" or healthy by any means it is a little lighter than the original and both Justin and I still enjoyed it just as much. I cut the recipe down from a 9x13 pan to a 9x9 pan since the original is a little too big for just two people and always makes way more leftovers than we need. It is still not something we have on the menu often but we do feel a little less guilty about eating it when we do. Do you all have any suggestions for any other substitutions we could make? Any other recipes from here you would like us to try and make over? Let us know! I love hearing from you! 1) Spray the bottom of a 9x9 pan with cooking spray and roll out the crescent dough to completely cover the bottom. 2) Cover the crescent roll dough lightly with crushed Doritos. 3) Brown the ground beef and then drain. Add taco seasoning and the water (half of what the packet says to use). Simmer for 5 minutes. Add the Greek yogurt and mix well. 4) Pour the ground beef over the crescent roll dough. 5) Top with shredded cheeses. 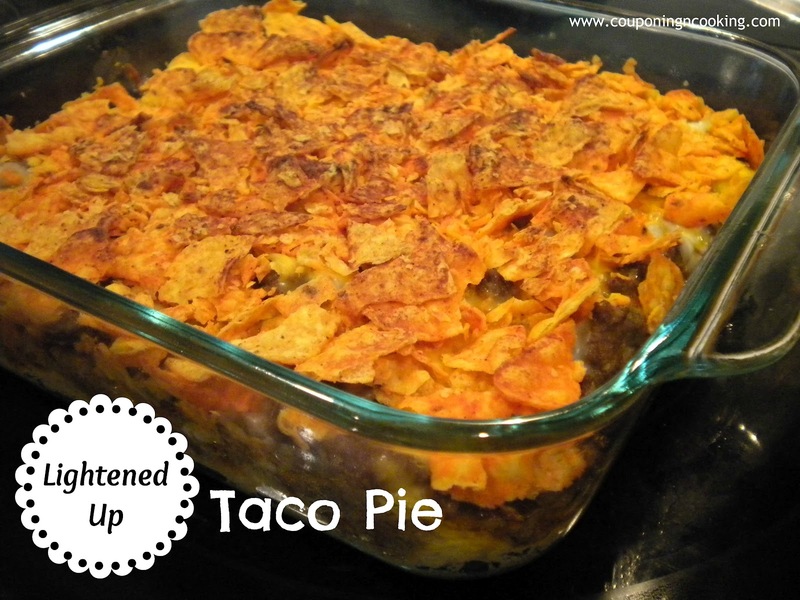 6) Completely cover with crushed Doritos. 7) Bake at 350 degrees for about 30 minutes or until top is browned and sides are bubbling. Let is sit for about 5 minutes before trying to cut and serve. Oh this looks and sounds mouth-watering! Love your healthier choices & changeups. MMMMM! Love the crescent roll crust and the crunch on top. how fun!! kids must love this! adults too..
O my goodness! This looks absolutely delish! I can almost taste it! This looks wonderful! Pinning for later! New follower from Miz Helen's Full Plate Thursday. This looks amazing. I have a link party on Wednesdays, and I would love it if you would link this post. It is called Wednesdays Adorned From Above Link Party. looks good! do you know how many calories are in a serving? Yum! This looks delicious and I can't wait to try this recipe. Thanks so much for sharing at Creative Thursday this week. Have a wonderful weekend. Yummy and looks so good - also glad you lightened it up a bit - every little less calorie helps! We love casserole type dishes and since it;s been cooler I've been making! Thanks for sharing your creative inspiration with Sunday’s Best – you helped make the party a success! I have never heard of Taco Pie but we make a mean spaghetti pie. :-) Thanks so much for sharing on Tout It Tuesday. Hope to see you tomorrow. My goal is to always try and make recipes healthier, not necessarily the healthiest. Thanks for sharing your lightened version, it looks delicious. If you get a chance I would love for you to come link up this recipe at my Pin Party. This looks like a great recipe! I love tacos and being light is even better. And thanks for linking up to my link party! You were the most clicked link and I'm featuring you tomorrow on my blog. Hope to see you again!